NEW ASDA George Rewards Scheme - Join Online Today! 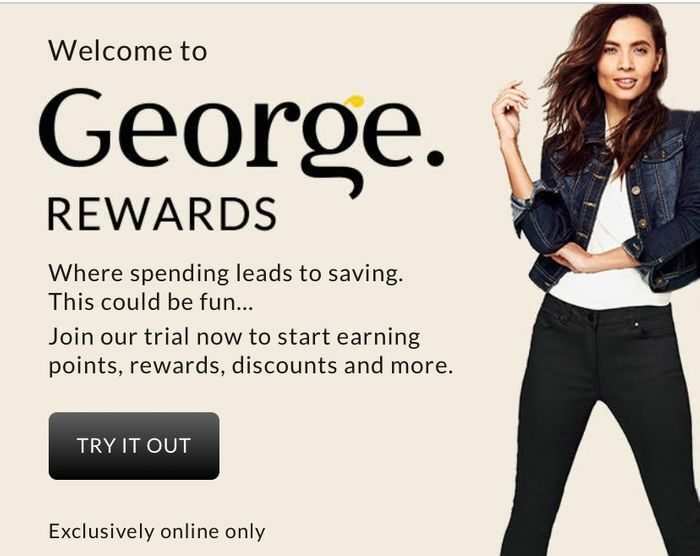 Join the trial for the NEW George Rewards scheme! You can earn 100 points just for signing up! For every purchase you make you will be rewarded with points. You receive 1 point for every £1 spent. You get 100 points just signing up. 150 points for writing a review, points for sharing your birthday, extra points for purchasing between 12am-12pm, points for click and collect, refer a friend. Free to join. Online only. What do you think of this ASDA deal? This is a great find. Will register, too.. Thanks for sharing. Wow finally asda trying out the reward scheme. Hope they start similar scheme on groceries shopping as well. Excellent, Just opted in. I buy quite alot from George so this might work out great for me. Thanks! Great find. Have signed up by following link. Points awarded for shopping and also for updating your birthday, writing a review or referring a friend. Brilliant. Thanks for the share. Gonna take a look now. I tend to do mostnof ku clothes shoping in asda as they last longer than places like primark etc. Wonder if its just online or shopping instore too? You can only get 100 points if you sign up to a new account. I’ve shopped before so they’ve already got my email so I don’t get the 100 points. Surely if Asda are now with Sainsbury's then Asda should just accept nectar card and points. Noones going to shop enough just on George products to make it worth it. Asda are not with sainsburys. That merger ain't going to happen. Not yet merged,if they do,Asda and Sainsbury's staying as individuals anyway. Does this still include Northern Ireland?? yippee!!!! It’s about time Asda George done something like this, My Mum would have had a field day - She was always in there! Don’t forget you can write reviews for items you’ve bought in the past. I just wrote reviews for 4 items I bought in store at Christmas and got 150 points for each one!! Thank you for this . That's brilliant that they have started this! Thank you so much for sharing or I would never have knew. Love this. Thanks so much for sharing. I don't know what you are taking about. George has by far the best quality baby clothes. Especially in comparison with Tu, Primark or F&F/Tesco baby. Good prices too. What more do you need? Diana1 Agree with you - don't know why some people have to trash another's post. I buy lots of kids clothes from quite a few of the big shops and George beats them wash for wash hands down.